This Easter season, no need for you to hunt through thick bushes or under a table to get your hands on your favorite treat—just head on over Krispy Kreme! Make Easter festivities extra special with Krispy Kreme’s egg-shaped doughnuts. Just in time for the season, your favorite melt-in-your-mouth doughnuts take the form of Easter Eggs and feature two new special additions that’s sure to get everyone in the mood for a celebration—Vanilla Iced Glazed and Easter Iced Sprinkles. 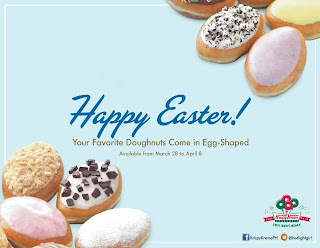 Krispy Kreme’s Egg-Shaped Easter Doughnuts are only available from March 28 to April 8, 2012. So hurry! Grab a box now and start sharing this “egg-sighting” treat with friends.